New England. What an amazing place to start a charter. Fresh, crisp, ocean air, waves smashing against rocks, and the smell of homemade clam chowda' and just baked - and stuffed - lobsta' rolls. You can't beat it! What would we recommend? How about starting your charter in Newport, Rhode Island, where the bars and nightlife is always alive, the restaurants are always packed, and the sailboats and yachts are always breathtaking to look at. You can fly into Providence airport and the Captain will pick you up and drive you through the wonderful small quaint town of Providence and over the infamous Newport Bridge. Once you arrive Newport, take a tour of the Newport Mansions, walk along the beautiful cliff walk, and most importantly, sit and watch the sunset at 41 North while enjoying mussels and a glass of sauvignon blanc. Just walking around this beautiful historical town is enough to make you fall in love with it. Next, your Captain will take you through some smaller towns with a seaport community, such as Martha's Vineyard and Nantucket, which have beautiful pristine beaches. Visit the famous Club Car in Nantucket for some wonderful piano music and lively entertainment (good food too!). Experience a close up encounter with whales! If you are craving the "city" at this point, your next cruise would be to Boston. Another wonderful, lively, city, full of culture and things to do.This is a great alternative for a one way trip, Newport to Boston. Continue through New Hampshire to reach Kennebunkport Maine which is filled with boutique shoppers and gallery hoppers during the summer months. Kennebunkport is one of the most prominent vacation towns during the summer months and has much to offer in the way of fine patio waterfront cusiine, wine, and most importantly, seafood! The people here are wonderful "locals" and very welcoming to tourists. 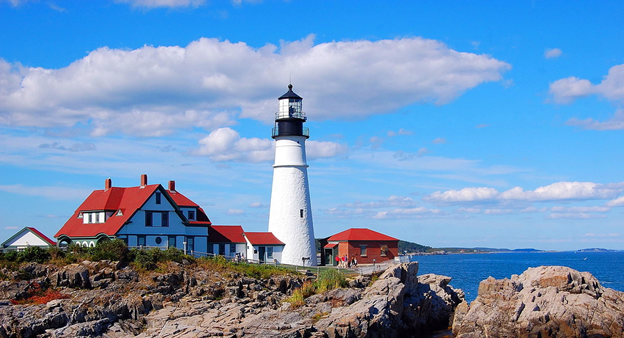 After a few hours, you will reach Portland, Maine, the largest city in Maine. Take a tour of Peak Island and be sure to have a coffee in the Old Port area. Boothbay and Camden are two of my favorite places and would be your next stops. They are both unique. 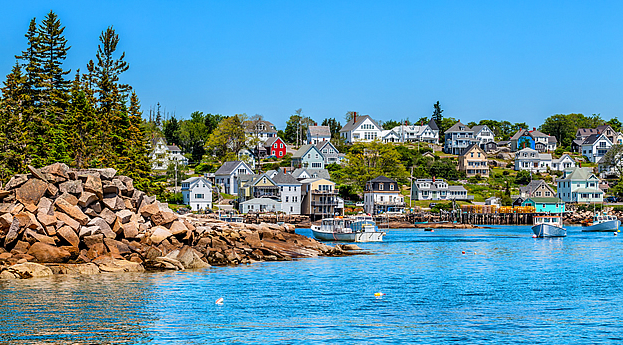 Boothbay is known as the boating capitol of New England. Boothbay is a lovely harbor and once the yacht is docked, you can ask to be taken (by tender) to the Lobster Pound, in Boothbay Harbor, where you pick your own lobster out (I prefer the 3 pounder). Orders come with corn on the cob and the basics, drawn butter. If you are an adventure type, there are over 20 miles of hiking trails to try out in Boothbay. Camden is just, well, breathtaking. It is the cutest town ever and I don't know how else to describe it. The cottages, the restaurants, the shops, everything, is just so unique. The blue waters and the natural scenery of this town just makes you take a deep breath and take it all in. Continue on to Bar Harbor, and take a carriage rideo on the scenic Rockefeller Roads in Acadia Park. We receomend to allow 10 days or longer for this itinerary - give or take - you might choose to extend your stay in certain parts of New England! We can not recommend it enough and please let us know how we can help you make it happen!